If fields, music and dancing are your thing, we’ve got your summer sorted. Check out our extensive 2019 festival guide below! More sunshine, lighter nights and less rain, summer has the recipe to make us all happier. But, it’s also the time of year when fields across the country are transformed for the next schedule of live events and festivals. Yes, festival season officially kicks off in May and there are so many exciting events taking place – whether you have a love of music, food or the arts. 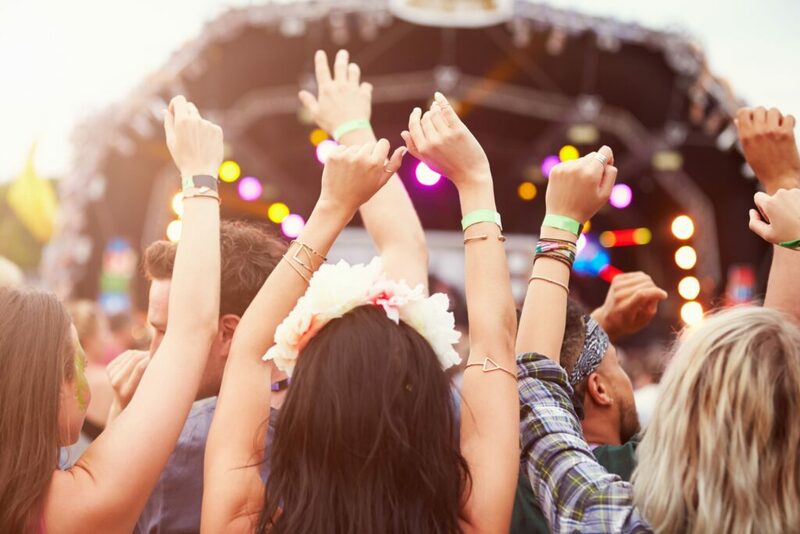 We’ve put together this extensive 2019 festival guide so you can know what’s happening and when in Staffordshire and nearby counties, as well as what’s in store at the larger UK festivals taking place. So forget work, difficult relationships and general #lifewoes and get yourself off for a hedonistic weekend in a field. We’re right behind you. This annual event is great for families. With its mix of rock, blues and soul, food and drink, displays, workshops and stalls, not to mention kids’ disco, inflatables and free access to Lower Drayton Farm, there’s lots for all ages. Dogs are also welcome and there’s space for camping, caravan and camper vans. With its Electronic, house and Indie acts – this year’s headliners include Noel Gallagher’s High Flying Birds, George Ezra and Biffy Clyro – the Isle of Wight Festival is the extravaganza by the sea. Combine it with a holiday so you can explore the island, as well as soaking up the festival atmosphere. In the heart of the Cotswolds, organisers promise this event is a combination of a music festival and a quintessentially English village fete. Featuring a line-up including The Beach Boys over four stages, a comedy stage, food, funfair and creative kids zone, it’s definitely a family affair. This music and performing arts festival is laid back and popular with families. This year’s line-up includes George Ezra, Lana Del Rey and Snow Patrol, as well as comedy from Jason Manford. There’s swimming in the lake, healing treatments available, a kids’ area with disco and pizza making, a teen area with workshops and crafts, as well as an enchanted garden. Celebrating 50 years since the moon landings and human advancement, this four-day event combines music, science and cosmic culture all within the grounds of Jodrell Bank Observatory. This year’s line-up includes music from Kraftwerk 3-D, New Order and Hot Chip, as well as science and culture talks. There’s plenty of fun for families too, with science shows, hands-on activities, tricks and animations. Perfect for families with young children, Camp Bestival is the brainchild of DJ Rob Da Bank. It features music, DJs, shows, attractions and lots of activities to keep all ages busy, with a large part of the site dedicated to children. The 2019 line-up includes Nile Rodgers and Chic, Jess Glynne, Human League and Sister Sledge, while for the youngsters there’s Cbeebies favourites Mr Tumble and Mister Maker and the Shapes, not to mention a kids theatre and circus, woodland crafts, science tent and soft play. There are also plenty of talks and food places. Warwick Folk Festival | July 25-28. In its milestone 40th year, this family festival provides a four-day music and dance extravaganza. Billy Bragg will headline and visitors can also enjoy ceilidhs, concerts, acoustic performances, shop at the craft stalls and try out street food. There’s also a programme of activities for 12-18-year-olds. Rewind North returns for its 11th year with a line-up of ‘80s icons, including Thin Lizzy, Gloria Gaynor, Bananarama, Tiffany and UB40. Rewind is famed for its fun family atmosphere. In the kid’s area, Ziggy’s will be hosting circus skills workshops, family sports days and giant bubble parties. The family-friendly festival, just two miles from the centre of Birmingham features a mix of traditional, contemporary and experimental folk. Headlining this year is Don Mclean. This is a small and intimate sober micro festival for conscious clubbers and sober ravers. The festival incorporates music and dance tied in with a spiritual ethos. This free event includes food, drink and craft stalls, live music, kids’ entertainment and displays. Set in the majestic grounds of Chillington Hall, this event features something for everyone, including talks and cooking demonstrations, live music and stalls. With stalls, tastings, cooking presentations and entertainment, including crazy golf, treasure hunts, music and puppet shows, this is definitely one for the family. There’s lager, gin, a pimms tent, wine and artisan alcohol, accompanied by pub grub and live music and comedy, so what’s not to love. The sixth annual event will include demos and a chance to try lots of produce. With demonstrations, a chef school, music and a kids’ zone, Shrewsbury Food Festival continues to attract the crowds. With lots to see and beers to sample, this is one for the beer fans. All about great local food and drink, this event includes lots of food producers, live music and kids’ fun. Staffordshire’s fastest growing food festival has become a major attraction, bringing in visitors from far and wide. With plenty of stalls, demos, talks, masterclasses, music and kids’ cookery classes, circus workshops and crafts, this is definitely one for all the family. The country’s best-known literary festival features talks and interviews with top authors, as well as music and comedy performances. The 2019 line-up includes Stacey Dooley, Julia Donaldson, Marcus Zusak, Sandi Toksvig and Jimmy Carr. Featuring award-winning authors, artists and entertainers the Festival in a Factory is a celebration of culture and creativity. Featuring readings, performances and workshops, a midsummer bonfire and poetry clinic. Featuring authors, information on getting published and workshops, this event is aimed at both writers and fans of independent fiction. This year’s open air production is the Merchant of Venice at Stafford Castle. A three-day event full of mystery, magic and mythical creatures, including workshops, arts and crafts, music and dance. A family adventure, featuring art, music, literature, comedy, theatre and games for all ages. One of the most well-known, the Edinburgh International Festival sees Scotland’s capital transformed for three weeks into a centre for dance, opera, music and theatre, bringing in thousands of visitors and performers from around the world. A huge sports and music festival, including rugby, hockey, netball and volleyball, as well as sumo wrestling and beer pong. Do as much or as little as you want to at this event, which includes bootcamp, Hiit work-outs, yoga and meditation, as well as music, artisan food and children’s activities. Filled with land and water outdoor pursuits, along with music, a fun fair, skate park and roller derby. Cyclists can choose from a 38 or 78-mile course.